Just the other day I had a chat with a friend about how we should open a bar, a kind of drunk conversation that always ends up with a crazy concept and a stupidly clever name. My idea was to create a bar with different beer bottles and a big selection of them. It should be easy-going, more of a hangout than a club. Just a place to enjoy yourself, meet people and have a beer or 10. Cut to one day later, where I go with some friends to Dupong bar. Turns out I’m not the genius I thought I was. 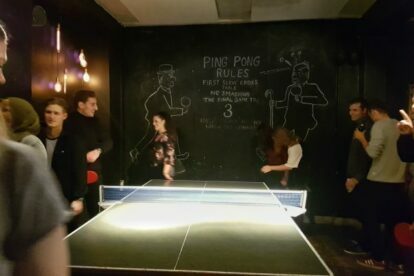 Here they had everything I imagined a bar should be: very cheap beer in bottles – and a lot of them, so there’s something for every taste; music, that makes it easy to talk, but still create a vibe; and a ping pong table. A ping pong table, where you “rent” the paddle for 30 kr. and get a beer in return, when you return it. Damn it this is clever. Play a round of “around the table”. Drink a beer while you are at it. Meet a new friend/ping pong challenger. It’s as simple as the name: Dupong bar – Beer and ping pong. Start here early. Go dance somewhere else afterwards. Maybe with your new ping pong buddy.